Trinity Catholic’s Caitlyn Scott drives to the basket defended by Fairfield Ludlowe’s Emma Torello during the first half on Jan. 22. During Caitlyn Scott’s freshman season at Trinity Catholic, the team won 2 games. Scott and the rest of the No. 7 Crusaders will be playing for the CIAC Class S state championship against No. 1 seeded Canton Saturday at 12:30 p.m. at Mohegan Sun. Last season, as a sophomore, Scott was joined at Trinity Catholic by Westhill transfers Iyanna Lops and Kyah Nowlin. The new-look team, playing under first-year coach Mike Martino, won eight games and upset No. 2 seed Canton in the First Round of the Class S state tournament. This season, Martino left the team for personal reasons at the end of December. In a pinch, the school called upon newly retired boys basketball coach Mike Walsh to take over the girls program. The reclamation project started by Martino would conclude under the tutelage of one of the winningest coaches in Connecticut boys basketball history. Arriving back at Trinity from a holiday break vacation in Florida, Walsh saw something from day one with the team. The team is 19-4 heading into the championship game, a long way from 2-18. One reason for the turnaround is the point guard Scott taking over a leadership role as a junior. Scott has not only improved her leadership, but on the court has become more assertive with the ball in her hands, both scoring and distributing. With Scott handling the ball, Lops has made the shift from playing on the perimeter almost exclusively to going to the low blocks, where the 6-foot-1 center is a match-up nightmare for most teams. Lops has seen the change in her game for the positive since committing to playing inside. Lops and Scott are not alone. 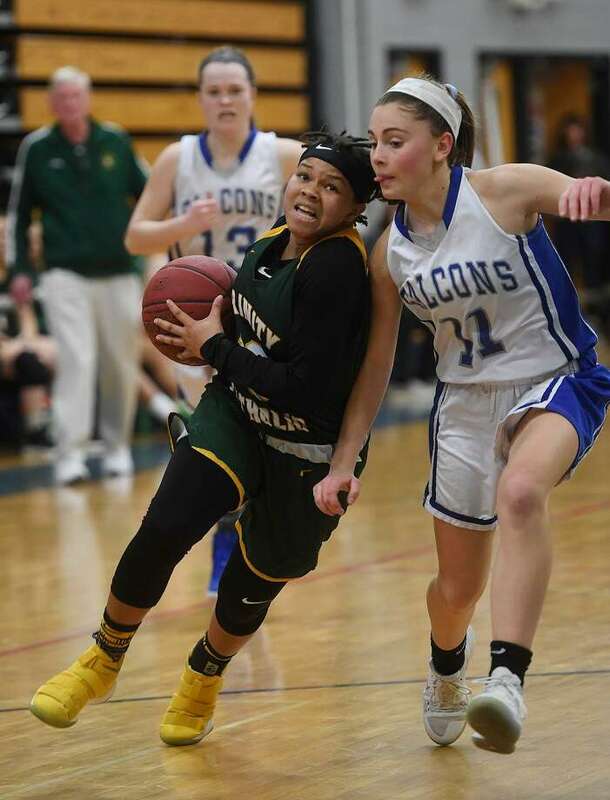 Senior forward Nowlin can score, rebound and get after it on defense; junior guard Kiera Fenske has range from 3 and crashes the boards and senior guard Emma Garner is tough on the ball defender. The Crusaders do not substitute often and any early foul trouble could put their short bench to the test. Almost every day at the end of practice, the team said it talked about getting to play at Mohegan Sun. Saturday that becomes a reality.